Using a dispute over pay as the pretext, Affco is attempting a direct assault on the union. Non-union members and new employees are not subject to the lockout. Affco is attempting to limit the union’s influence for what management refers to as “critical commercial reasons”. Under the company’s proposals, the workers at Affco would be expected to work faster, processing more carcasses per hour, without an increase in their pay. 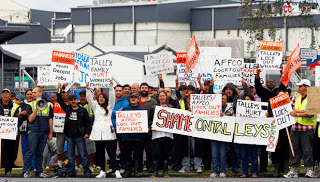 Meanwhile, Affco is owned by the Talley family – one of the richest families in New Zealand. « Crafar Farm Sale: whose land is it anyway?